Argyll Journeys is a new YouTube series created by Markus Stitz, which takes you off the beaten track on Scotland’s Adventure Coast. As adventurer and filmmaker Markus travels to his favourite places in Argyll, and you can download the GPX file for each activity afterwards. The first part of my cycling journey in Argyll takes me on the Caledonia Way, NCN Route 78. At a length of 237 miles the Caledonia Way travels from Campbeltown on the Kintyre peninsula to Inverness. I join the Caledonia Way in Kentallen and travel south to Port Appin. Kentallen, situated on the shores of Loch Linnhe, was formed around the former Oban to Fort William railway line. The first stop is Castle Stalker, a prominent landmark in the Lynn of Lorn National Scenic Area. Castle Stalker is one of Argyll’s most popular and iconic structures, brought to fame by the Monty Python team in the 1970s in their film Monty Python and the Holy Grail. 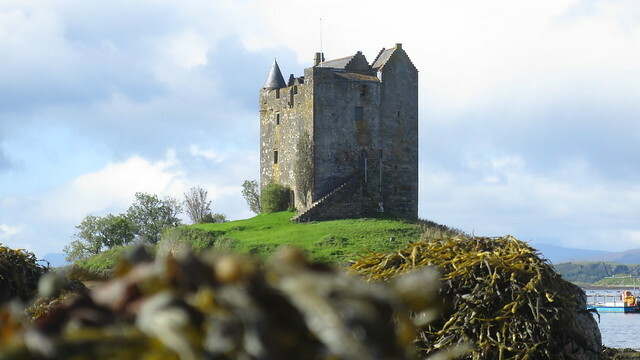 It holds a commanding position and is one of the best-preserved medieval tower houses to survive in western Scotland. The name Stalker comes from the Gaelic Stalcaire, meaning hunter or falconer. Shortly after Castle Stalker I leave the Caledonia Way and join the Appin Loop, crossing the Jubilee Bridge. The bridge spans the saltmarsh, known locally as The Marach, and is an iconic symbol of Appin life. I continue my journey on quite roads to Port Appin. This is undoubtedly one of Argyll’s most picturesque spots. From here a small ferry leaves to Lismore, a great island for walking and cycling. You can also continue cyling on the Wild About Argyll Trail, a loop that runs 655 kilometres along Scotland’s adventure coast. Easdale is part of the islands that once roofed the world, the Slate Islands. There are no cars on Easdale, so I take a small ferry over to the island. Extensive slate quarrying has left its mark in the landscape of the islands, and Easdale is the smallest of them. It is hard to imagine that more than 500 people worked here at the heyday of the slate mining industry, which started in the early 17th century and continued for almost 300 years. Easdale slate was used to roof Castle Stalker and the Glasgow Cathedral. A massive storm in 1881 flooded many of the quarry pits which are still visible today, hastening the demise of the industry. In the 1960s only 4 people were left to live on the island. Today the once active quarries provide a safe haven for a wide variety of flora and bird life. This is the perfect place for a walk. With much to discover I leave the harbour and walk westbound. I am by myself here to enjoy the fresh Atlantic air, with not a single midge in sight. Although the highest point of the island is a mere 38m above sea level, the views from here are terrific. To the west Mull dominates the view, and being higher up, I get a much better idea of Easdale from here. On the last Sunday of September hundreds of competitors descend on the tiny island for the World Stone Skimming Championships. The rules are strict. All stones must be of naturally formed Easdale slate and be no more than 3 inches in diameter at their widest point. Each competitor will have 3 skims per session. The stone must bounce on the surface of the water no less than 2 times before being considered a valid skim. The length of the skim will be judged to the point where the stone sinks into the water. And as you would imagine with a World Championship, the longest skim in each category will be deemed the winner. Back on the mainland I end my day with riding one of my favourite parts of the Wild About Argyll Trail, Bealach na Gaoithe: the ‘pass of the winds’, which takes me to the Degnish Peninsula, past the Ardmaddy wishing tree. From here I cycle to on a small and winding road to Kilmelford, and back on the A816 to Kilninver, and back to the start of the loop.